Panipat is a town in the state of Haryana, North West India, located on the Western Yamuna Canal. It is on a plain astride an important route linking Afghanistan to central India, and as a result, has been the location of several battles. In 1526, Babur defeated the Delhi Sultanate in Panipat, effectively paving the way for the formation of the Mughal Empire. In 1556, Akbar defeated the Afghans at the same spot, securing Mughal rule, and in 1761, Panipat was the site of an Afghan victory over the Marathas. 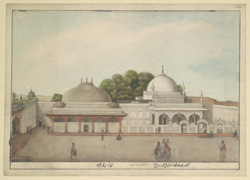 This image the 14th century domed tomb of Abu 'Ali Qalandar, with its late Mughal portico and entrance screen, and the adjacent tomb of Nawab Muqarrab Khan (d.1646). Groups of people are shown standing or talking in the courtyard.